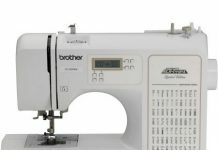 Brother SE600 Sewing machine review - Read this before you buy! It is a cheap sewing machine, an upgrade of the SE400 version. It comes with first-class features and accessories that we are going to discuss in this sewing machine review. Among many top sewers, Brother is a favorite choice. 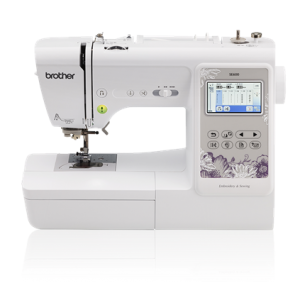 The Brother SE600 sewing machine stands out with durability, functionality, versatility, and price, it’s great value for money. I mean, It’s a top sewing machine that comes at a very cheap price. There are many amazing features which enable you to edit your embroidery designs and get them previewed before applying it to your projects. In other words, you get to really feel how a design looks like before even carrying it out, how cool is that! Other amazing features of Brother SE600 sewing machine are the 103 built-in stitches that enable you to handle both light and heavy fabric without a hitch. Besides, you are given the ability to decorate your sewing project with fascinating stitches and get shapes like waves, ripples, hearts etc. 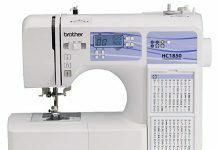 With many stitch options right in your fingertip, the Brother SE600 sewing machine is a steal! Here we discuss some of the useful features that come with the Brother SE600 sewing machine. 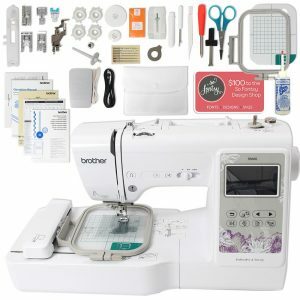 It’s a computerized sewing machine which means that buying the SE600 gets you a sewing machine and an embroidery machine in one. In order words, you have the ability to handle all your sewing jobs and demonstrate your embroidery skills – How sweet! You have over a hundred built-in stitches to adorn your craft with various stitch patterns. This is one of the areas where the Brother SE600 sewing machine stands out from other sewing machines. Many single purpose sewing machines don’t have this much built-in stitches. There is an internal memory that allows the machine store eighty built-in embroidery designs for your use. Also, you have the option to download any embroidery design that appeals to you from the internet and transfer it to your machine via the USB port. When you get sewing or an embroidery machine, the ease of use will be one of the top things on your mind. Luckily, the Brother SE600 sewing machine stands out in that setup and usage is pretty easy. There is an instruction manual that guides users on setting up and using the machine, no guesswork at all! Brother SE600 sewing machine is a 2 in 1 machine that handles both sewing and embroidery work perfectly. Are you a fashion designer? Do you need a sewing machine for use at home? Are you into embroidery? The Brother SE600 sewing machine has all the essential functions needed to help you get the task done. With LED lights, the work area of the Brother SE600 sewing machine is brightly illuminated. With this, no matter the lighting condition, no matter the time of the day, nothing can hinder your project. The LED lighting is particularly helpful when handling dark colored fabrics, or doing free motion sewing quilts. The Brother SE600 sewing machine comes with a jam-resistant top drop-in bobbin. It stands out from other sewing machines that have the side-loaded bobbins. A drop in bobbin makes it easy and convenient. There are some people who do have difficulty getting the thread through the needle eye. The automatic needle threader is a savior here. With this feature, (automatic needle threader) threading your needle is quick and easy. This is one of the best things about the Brother SE600 sewing machine. There is a USB port with which you can transfer embroidery designs that you downloaded from the internet or other sources to your SE600. Hence, you are not limited to the 80 embroidery designs that come with the machine, but you can get as much as you desire. 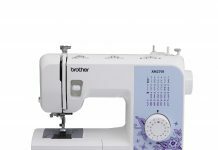 If you are looking for a multipurpose sewing machine for use in your home or workplace, the Brother SE600 sewing machine is a terrific choice. While some people find it a bit pricey, It comes with awesome features that make it stand out among other brands. There are also advanced features that make this sewing machine atop choice. When you think of all the beautiful features of the Brother SE600 sewing machine, then you can conclude that this sewing machine is a steal!